1. 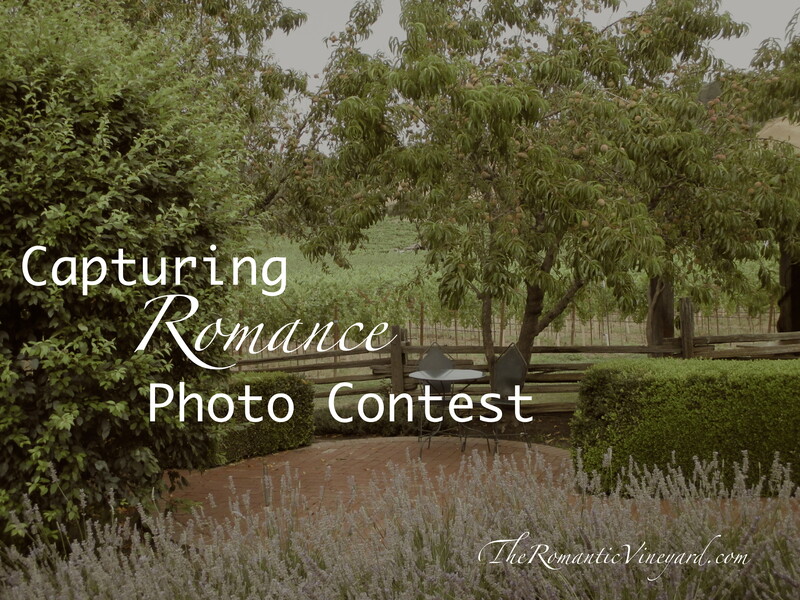 The Theme for the contest is “Capturing Romance” and is open to anyone who is married or engaged. 2. Only one entry per person. This means each couple can submit two photos, provided they each took their own picture. No professional photographers, please. Amateurs only. 3. Each photo must be your original and not something found elsewhere. Only basic editing is permitted, such as cropping, red-eye, etc. 4. Photos will be judged on Theme, Clarity, Unique Perspective, and Overall Beauty. In other words, we should all want to be in the photo, if we could. Oh, and please, photos should be “G” rated. Anything deemed inappropriate will be omitted at our discretion. 5. Photos must say where the shot was “captured”. It can be a recent photo, or one you took a long time ago, as long as the first 4 rules are observed. 6. Submit your entries by uploading them on our Facebook Fan Page, or if you prefer, you can e-mail it to us: theromanticvineyard(at)gmail(dot)com. Be sure to tell us your name, and where the photo was taken in the caption portion of the picture. (See Photo at top of post for example) Any photos not marked as such, will not be judged. 6. Contest will end on November 11th at midnight. 7. We will announce the winners on November 12th. And here’s the fun part – we will award a First, Second and Third place winner. First Place -$50 Gift Card for a nice dinner out. (winner’s choice). Second Place – $25 Gift Card for a night at the Movies. There you have it! Get your cameras ready and start capturing some romance! Tom and I would like to thank you for helping us celebrate SIX YEARS. God has been very good to us, and we pray your marriage has been helped too. Marriage is a journey, not a destination, and only God knows where it is He wants us to go. He will faithfully bring us there – one day at a time. This entry was posted in Capturing Romance Photo Contest, Celebrations, Contests, Romance in Marriage and tagged Celebrating 6 years, marriage, Photo Contest, Romance, The Romantic Vineyard Photo Contest. Bookmark the permalink.